Strawberry jam is perfect for baking, deserts and just for morning toasts or sandwiches. If you're not too stuck on buying store bought jam, or just want to try you hand at something new, this strawberry jam recipe is perfect for you. Surprisingly, strawberry jam isn't that hard to make and can be done with a few ingredients right in your own kitchen! Before you make the jam, half you strawberries and check for soft spots inside. 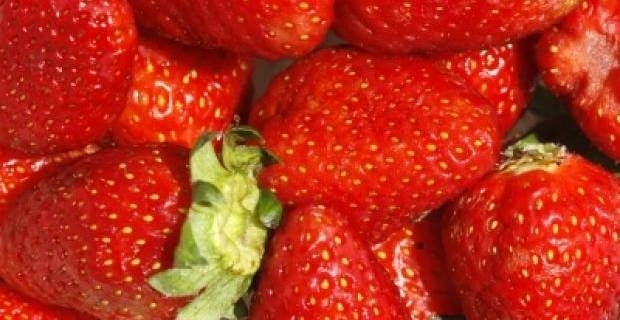 Discard any strawberries that have bruises, soft spots or over-rippeneded berries. Place the strawberries in a bowl with 500g of sugar. Coat the strawberries well and cover the bowl with clinge film; place in the fridge overnight. Place a saucer in the freezer on the day you intend to make the strawberries, which is required for testing the consistency of the jam. Sterilise your jam jars - you can do this with your own method, or you can soak them in soapy water, allow to drip dry and place in an oven at 140C for half an hour. Pour the strawberries into a large pan. Make sure to pour all the juice and sugar residue into the pan with the strawberries for a full-bodied taste. Add the remaing 500g of sugar and the lemon juice. Stir the strawberries, lemon juice and sugar over a low heat. Bring the strawberries to boil until they reach setting point. To test setting point, remove the plate from the freezer and place a little jam onto it from the sauce pan. If the jam wrinkles when touched, it's reached setting point - but if it moves and acts like a liquid you'll need to boil it further. When setting point is reached, turn off the heat and stir in the butter to the mixture. Let the jam cool in the pan for ten minutes so it won't stick to the jam jars. When your strawberry jam recipe is cool, begin to spoon the mixture into the sterilised jars. If you have a funnel, use it to perserve most of the mixture. It's important for the jars to be sterilised to avoid the presence of bacteria, would could mold the jam and cause stomach upset. Once the jam is in jars, store in a cool dry cupboard.